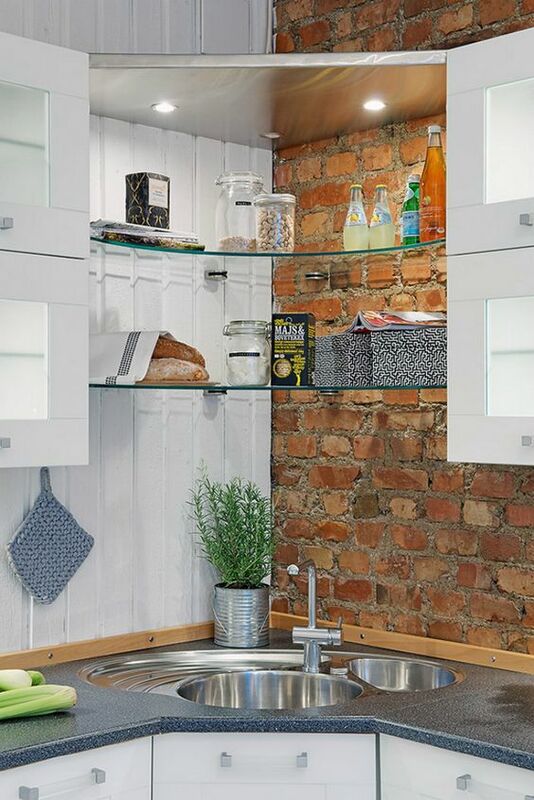 Corner sink for kitchen becomes the best solution for you who feel confused about the corner space which sometimes it is left empty and less-useful. With these inspiring corner sinks I’ve collected from the best online sources & experts’ designs, it’s the right time for you to transform and to optimize this ‘dead’ space into cool & of course practical one by moving your sink to this corner space. I bet you’ll have a better cooking experience. 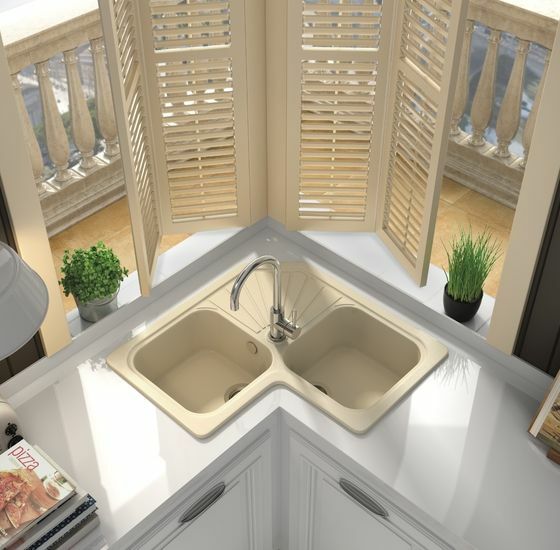 Well, here are the corner sink designs that probably fit your kitchen. You’ll deserve the cleanest-lines and simplest look just with this corner farmhouse sink design. 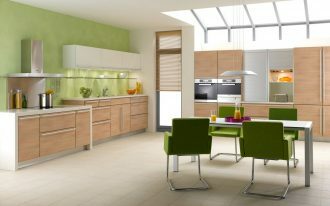 The design goes with the green & fresh plantation nearest the corner sink. The sink is designed larger and deeper for cozier and more practical use. 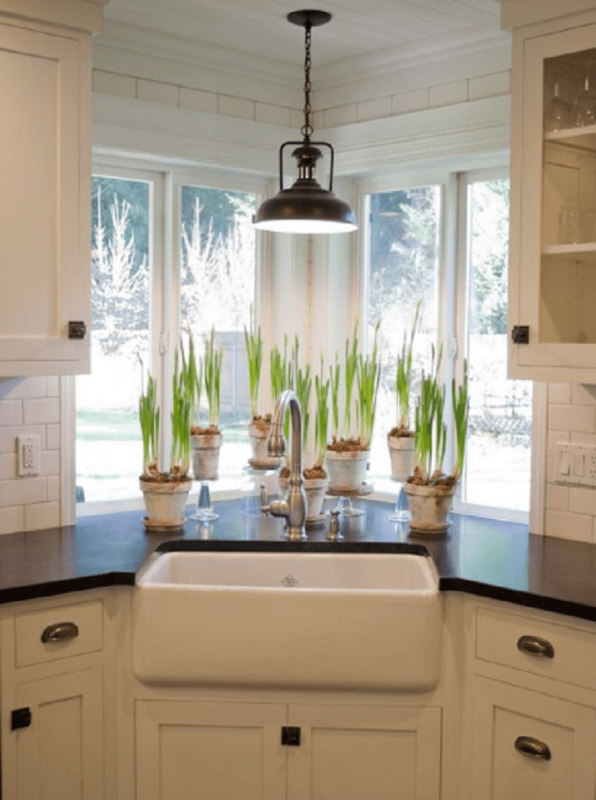 The pendant placed rightly above the sink provides sufficient light for the whole corner sink area. 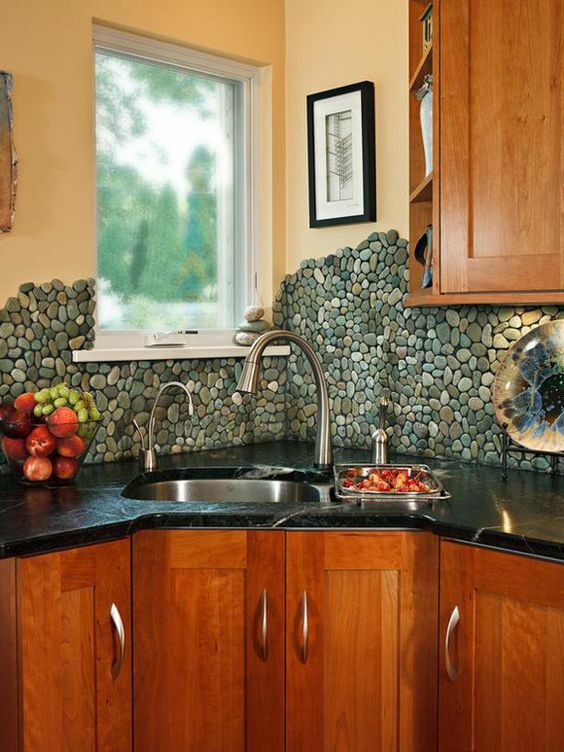 Stoned blacksplash and black counter perfectly blend each other, bringing more natural yet elegant look to the kitchen. The corner sink also performs most practical use since the sink offers deeper surface so the user feels cozier when using it. 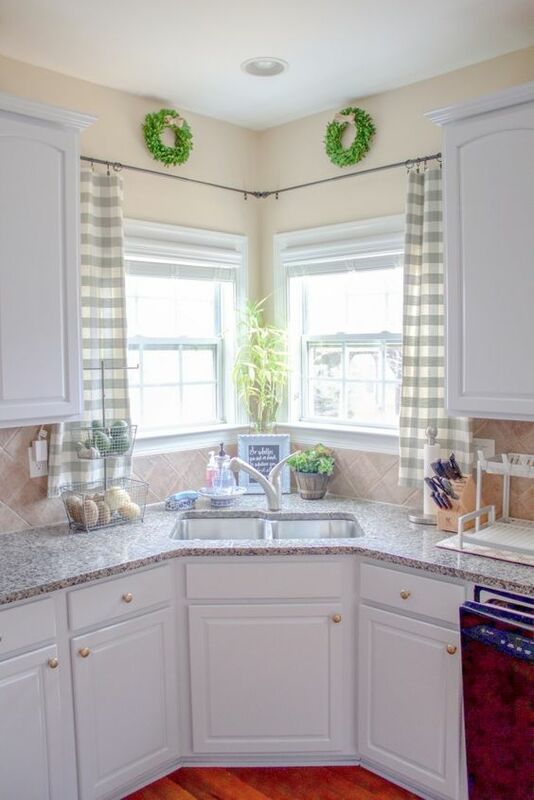 Bright, light, and cheerful kitchen with simple corner sink. 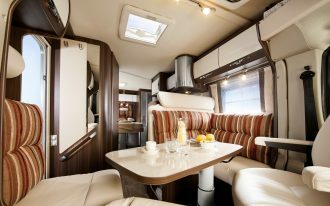 The sink’s position is right after the corner windows that give you sufficient natural light and amazing sight out there. 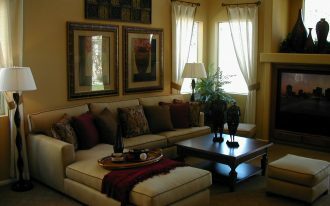 And this curtains pair isn’t just a light filter, but also a dramatic window accent. Beautiful! If you’re feeling bored with ordinary sink setting, why don’t just move it to a bit cornered spot right under the corner cabinets. 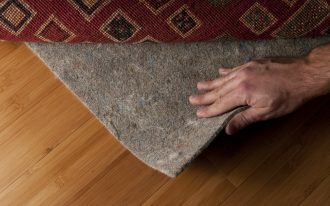 The position creates a perfect new setting which probably won’t be found in other homes. But, be careful when you’re busy in this spot; make sure your head’s safe, keep your head away from the cabinets. 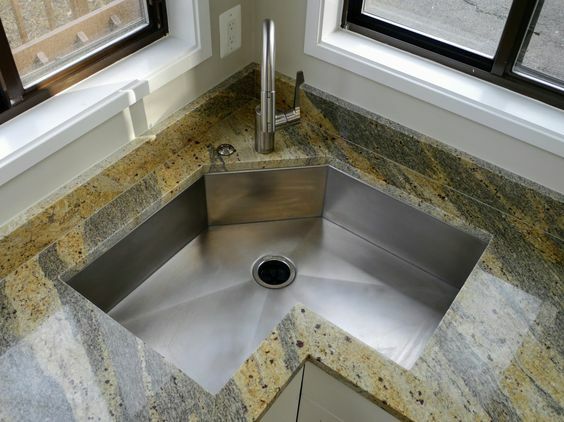 What a perfect corner sink! There are two sinks for accommodating more loads. A movable faucet of course will ease the user to mobile it any spot of sink when needed. 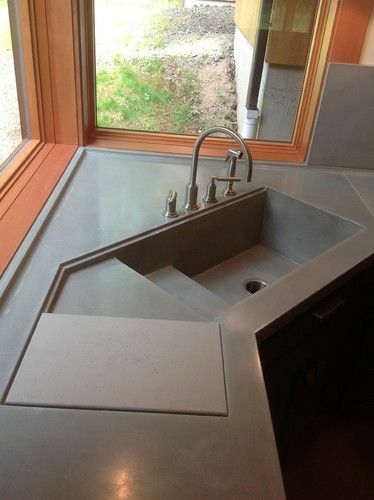 I personally love this corner sink very much. 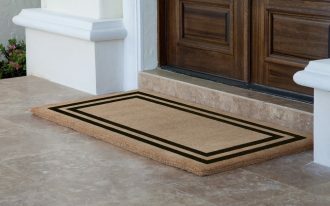 If I may say this one is the best choice for my dream house. The window shutters and the plantations make the atmosphere more airy. Love it! 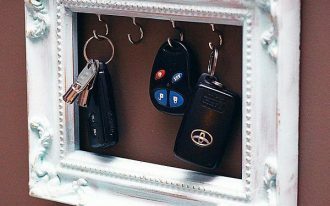 Let’s think out of box. 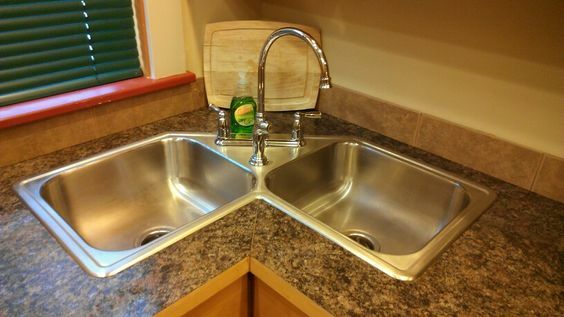 The kitchen sinks are available in round shape and they can fit the corner setting properly. 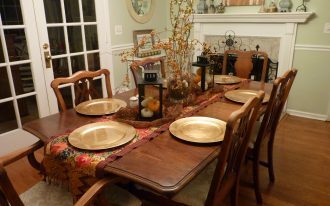 Like this one; there are two pieces of rounded sinks installed side by side complete with a little drying pan & faucet. Overall design is unique and characterful. The sinks look like a mirrored object. The one is reflective to one another (visually) as they have been designed in exactly same shape and material. They aren’t only aesthetic, but also functional, especially for small kitchens. Rustic matte corner sink with butterfly shape. 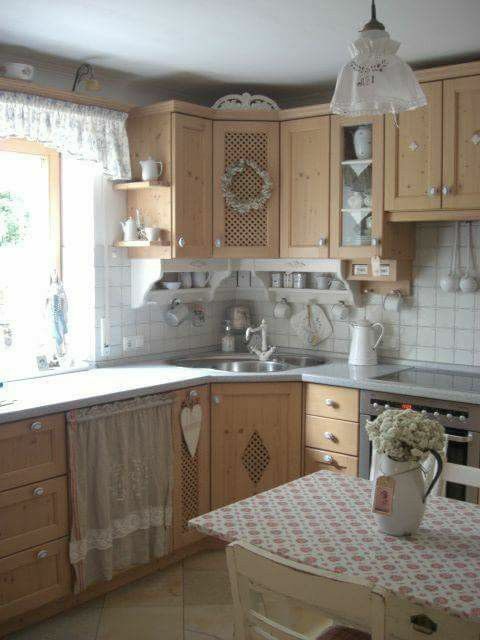 It’s less rustic but still exposes the original scheme of rustic. Dissimilar-size undermount sinks took my interest. 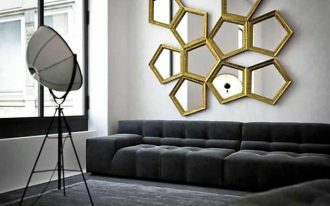 They’re designed for different purposes, and their simple shape depicts modern style chosen by the homeowner. 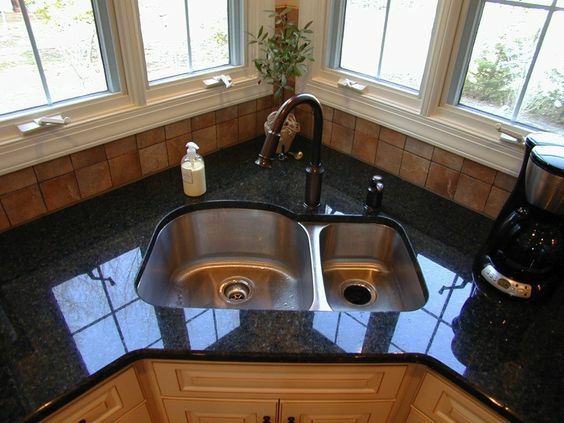 Glossy black countertop really helps to create a beautiful contrast between the surface and sinks. Perfect color combination! A modern corner sink with additional sliding cutting board. 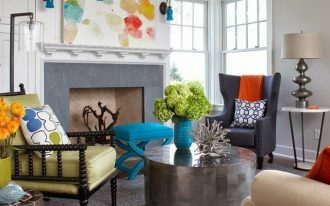 Look at the color; the designer cleverly uses one tone of color: doff dark that really fits the wood-trimmed window. Simple with dark color yet so elegant and minimal in look.